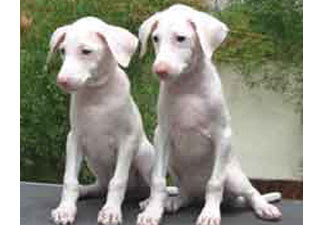 Breed Group: Working The Rajapalayam is an Indian breed of dog. It was the companion of the royalty and aristocracy in Southern India, particularly in the town from where it gets its name. It is also known as the Paleiyakaran or Poligar Hound. Distinct feature: It is a large dog, usually measuring about 65-75 cm (25-30 inches) at the withers. It is a hound, and therefore should be kept in optimum working condition. It tends to be heavier boned than most sighthounds, but shares the depth of chest and basic body structure. Its facial structure is considerably different from that of, say a Caravan, as it is meant primarily for hunting wild boar. The tail has a slight curl. The most prized colour is milk white, with a pink nose and golden eyes. However, other colours including spotted or solid, black, and brown, are known to occur. In the past, puppies of colour were usually culled from the litters since the owners preferred the pure white dogs. The coat is short and fine. An extremely handsome and graceful dog, the Rajapalayam has a gait similar to the trotting of a thoroughbred hors Temperament: The Rajapalayam was used predominantly for hunting wild boar and as a formidable guard dog. It needs wide open spaces and is very affectionate and devoted towards its owner, although not always demonstrative. It does not like to be touched or handled by strangers, and tends to be a one-man or one-family dog. This puppy are born with the same family this puppy will be very thin so poor guys.